Home > Blog > Why Do Children Snore? If your child snores you may think that it is only a problem in your household, however, research suggests that around 30% of children snore and of that 10% snore regularly. Obesity: this is the number one cause of snoring and is increasing as obesity increases in children. Pharyngeal problems: Children and adults who have pharyngeal issues such as enlarged tonsils can often snore. This can continue for many years or until the tonsils are removed. Head colds: Head colds are a very common reason for snoring and usually the snoring will cease once the infection has gone. Family history: There can be some genetic factors in snoring, and also more males are prone to snoring than females. Smoking: Either smoking by the individual or passive smoking can contribute to snoring. Sleep apnea: Snoring is a strong factor in sleep apnea. Episodes of snoring are usually categorized by periods of silence as the breath is held, before resuming again. If you suspect sleep apnea this should be investigated by a Pediatric ENT specialist. Apart from keeping you awake, snoring in children can affect their cognitive abilities in the morning. Sleep apnea should be diagnosed as quickly as possible and treated. If not, it can lead to developmental delay or impaired learning. There is research to suggest that this could also be a contributory factor in bedwetting or behavioral problems in children. 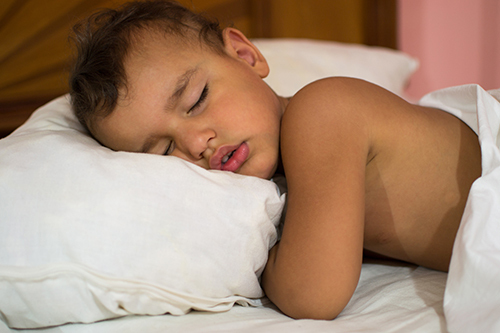 Sleep apnea can be quite scary for parents of a child with it. The condition is caused by intermittent obstruction or obstruction in the airway. This can reduce the amount of oxygen the person breathes in and raises carbon dioxide in the blood. In addition, snoring, sleep apnea can be categorized by gasping sounds as well as restless sleep. This can result in feeling tired during the day or being subject to headaches in the morning (due to the carbon dioxide). It can also affect mood swings and behaviors. A Pediatric ENT expert will need to assess your child to properly diagnose sleep apnea and this will include a sleep study. All snoring can be treated, whether it is due to asthma requiring regular medication, regular exercise, reduced calorie intake or medical intervention. A full Pediatric consultation should be undertaken to establish the exact cause or reason for the snoring and then the right treatment can be prescribed. ← Could Your Child Be Missing Developmental Milestones Due To Hearing Loss?